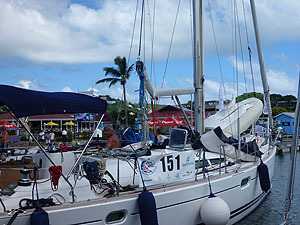 Here’s another photo from the finish of the ARC in Saint Lucia – one of several broken booms this year. This is an annual feature of the rally unfortunately, but there were a few more than normal this year. The shame is that almost all of them are avoidable. You need to rig a preventer and lead it the right way. This 49ft French catamaran rigged a preventer downwind, but in the wrong position. If you enlarge the photo you can see exactly why this one broke during an accidental gybe. running to the bow and back. David Durand, a crewmember on the catamaran told me they knew that they shouldn’t have led the preventer straight to the midships cleat at this acute angle but they lacked a spare winch or fixing point aft. Hmmm. You could lead a preventer right forward and make it off back at a quarter cleat if you had to, or maybe invest in a mobile clutch that you can move around as it’s needed. They’re damned expensive, but not as much as a new boom… Here’s an option from Spinlock. Here’s another break. The boom on this yacht folded neatly round the central mainsheet attachment during an accidental gybe. They weren’t using a preventer.